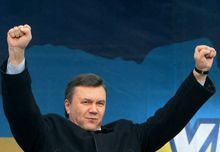 Leader of the Party of Regions Victor Yanukovych says that his aim and dream is a unification of Ukraine. According to an UNIAN correspondent, he said this at the 6th Summit of Yalta European Strategy. “Today it is my big aim and my big dream – to unite all the country”, he said answering the question how he will build relations with his political opponents and their adherents if he becomes the President of Ukraine. At the same time the politician expressed an opinion that there is already no border between East and West of the country today.